Ships tomorrow if you order in the next 16 hours 49 minutes. * Colostrum is a highly-concentrated source of powerful immune and growth factors produced from mammary glands shortly after giving birth. Pure Encapsulations Colostrum is derived from BSE-, hormone-, pesticide-, and antibiotic-free herds providing a pure, rich source. As a nutritional supplement, bovine colostrum provides exceptional, synergistic support. Immunoglobins, the most abundant types of immune factors in colostrum, are large protein molecules that include Immunoglobins G (IgG), A (IgA), E (IgE), D (IgD), and M (IgM). Each has a specific role in natural defense, including activation of various immune cells. IgG is found in the highest concentration and helps to neutralize toxins. Lactoferrin is a versatile, iron-binding protein which enhances the bodys ability to utilize iron and also stimulates immune system cells. Proline-rich Polypeptide (PRP) is a hormone produced by the thymus gland to help balance and activate the immune response. Lymphokines, interferons, and interleukins are proteins that activate the functions of various immune cells. Oligosaccharides and lysozyme help maintain a healthy intestinal membrane and promote the growth of friendly bacteria. 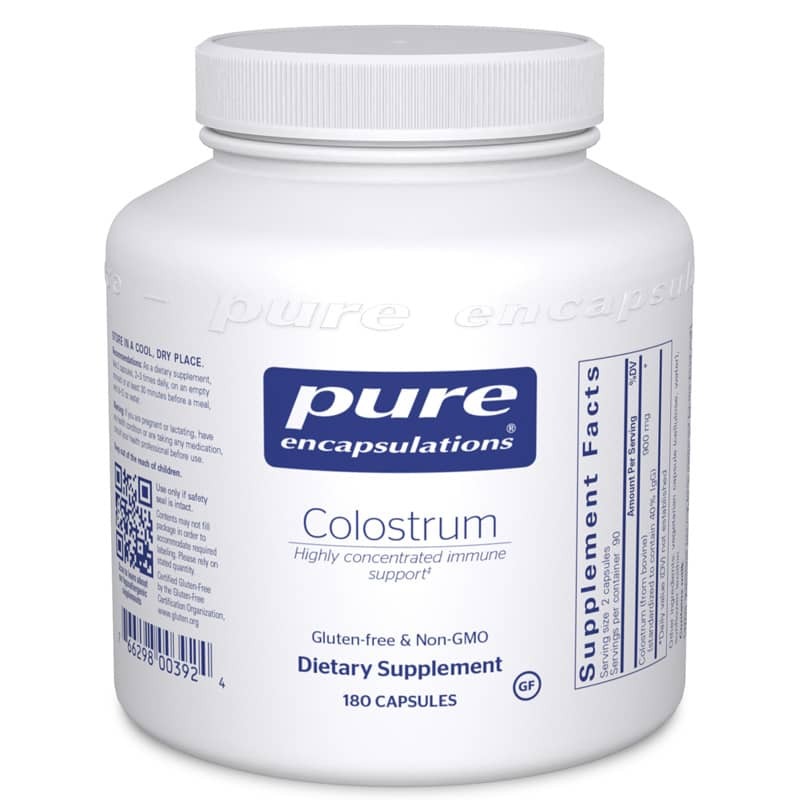 Studies show that other components of colostrum also promote intestinal function. Growth factors include insulin growth factors (IGF-1 and IGF-2) and transforming growth factors (TGF-A and TGF-B). These growth factors, identical in composition to human growth factors, have the potential to enhance immune cell function and to nutritionally support healthy connective and nerve tissues in the body. Furthermore, growth factors promote glucose and fat metabolism for fuel, support protein synthesis, and help maintain lean muscle. This supports healthy body composition and has demonstrated the ability to enhance speed and strength training. Todays dairy cows produce on average four to five gallons of colostrum in their first milking. The calf consumes one gallon of colostrum in its first two feedings, assuring passive immunity. The excess colostrum is not fed to the calf as it can cause intestinal upset after the first feedings. This excess is an ideal source for use in nutritional supplements. Pure Encapsulations Colostrum, derived from USDA and FDA certified dairy farms in the US, is defatted and processed at low heat to preserve nutritional activity. It is standardized to contain 40% IgG and is also a concentrated source of lactoferrin and IGF- 1. Colostrum is a nutrient-dense combination of immune system components and growth factors for supporting optimal natural defense, intestinal function, connective tissue health, and athletic potential that cannot be found elsewhere in nature. Other Ingredients: vegetarian capsule (cellulose, water), sunflower lecithin. Contains NO: gluten, artificial additives, allergens, GMOs, environmental contaminants or added excipients. Adults: As a dietary supplement, take 2 capsules 2-3 times daily, on an empty stomach or at least 30 minutes before a meal, with 8 to 12 oz of water. If you are pregnant, nursing, or have a medical condition, please consult your healthcare practitioner before use. Keep out of the reach of children. My naturopath recommended this Colostrum. I take it daily and I can tell it is helping! My order was cancelled yet I had called and gave a new credit card. This med has helped my son stay out of the hospital for 2 years! I hope this can be fixed ASAP for my son's sake.